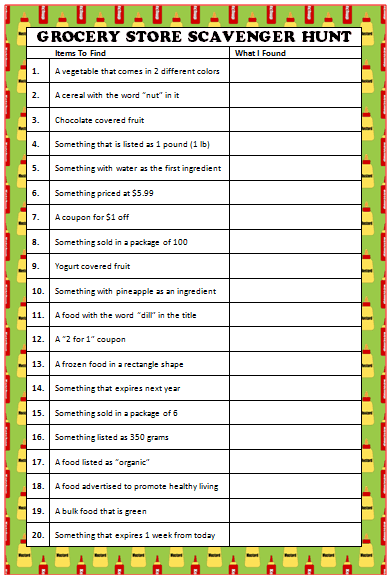 Here’s a fun activity to keep your children busy while grocery shopping – a grocery store scavenger hunt! Use this free printable to keep your children entertained while you fill your cart with your weekly groceries. For the older kids, it is also a great way to teach them more about where to find items at the grocery store and how to make smart choices when it comes to purchases (reading labels, comparing prices, etc.). To play the game, just have the children point out the items to you as they find them. You can even award a fun grocery item treat once they’ve completed the challenge. Older children could also write their answers on the free printable game. How well do you know your way around the grocery store? Moms & Munchkins is filled with fun & free printable games like charades, scavenger hunts, BINGO cards, word searches, word scrambles and more. Check out all of the freebies on the Free Printable Games page. Stay updated on the latest fun ideas by following along on Facebook, Twitter and Pinterest. We look forward to seeing you in our social media communities!